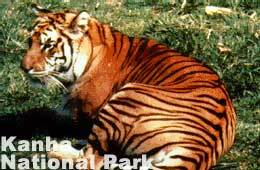 India offers many popular national parks, which are natural habitats of various animals, and rare species. A wildlife tour in India would take you to the famous Kanha National Park in Madhya Pradesh, one of the finest wildlife parks in the country. This national park is spread out over an area of 940 sq. km. The park is home to over 22 different species of mammals and some 200-bird species and is well placed in a horseshoe shaped valley. The Kanha National Park is an excellent place for wildlife viewing and photography, especially for the nature lovers. The abundance of wildlife species exists today in Kanha National park, which forms the core of the Kanha Tiger Reserve created in 1974 under Project tiger. The grasslands at Kanha are interspersed with forests of Sal, teeming with varieties of deer - the barasingha, chital, chousingha, nilgai, the majestic gaur and the wild pig. It is ideal for viewing both the predator and the prey. 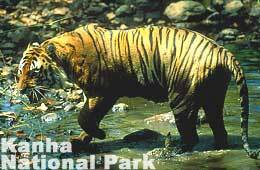 It was here at Kanha that the eminent zoologist George Schaller undertook the first ever-scientific study of the tiger. Another landmark at Kanha is the preservation of the 'hard ground' barasingha the only surviving population of this Central Indian subspecies. This was achieved by extending the grasslands, relocating villages and by increasing the habitat. It is only here that you would find the unique barasingha, being the hard ground variety, which populate the large open tracts of grass amidst the forests of teak and bamboo. Twenty years ago, the barasingha was faced with extinction but some desperate measures including the fencing-off of some animals helped save them and this is how Kanha was established. The Kanha National Park still retains its beauty and was the inspiration behind Rudyard Kipling's unforgettable classic Jungle Book. The animals at Kanha are best observed from elephant back and the open country makes the chances of sightseeing reasonably good. Deer are seen along the maidans and gaur at Bamhnidadar or in the Bishanpura Sondhar-Ghorella area of the Mukki range. This area is also ideal for spotting the dhole or wild dog. Langurs, wild boar, waterfowl and birds are also commonly seen. One can easily spot tigers at Kanha. Among the large animals, the Indian bison is perhaps the most difficult to view because of its nocturnal habits. Usually, one comes across a herd either in the late evening or very early in the morning, and the light is always a photographer's nightmare. It is said that you can usually spot a bison at the road upto Bamhnidadar. Besides Kanha, Madhya Pradesh boasts of some extremely good Reserves of which Bandhavgarh is perhaps the best linked, from a tourism point of view, to the famous Khajuraho temples. Besides the tiger and the leopard, this Reserve, like Kanha, is extremely productive for medium-sized bison herds. The drive from Kanha to Umaria, the headquarters of Bandhavgarh, is through some very desolate country. A short drive from Kanha, would take you to Umaria by train from Delhi as it is on the main Orissa line, or driven through Gwalior, Jhansi and yet another Tiger Reserve on the banks of the Betwa river, Pench. In the morning, one could look up from the valley below to the table-like cliff where the Bandhavgarh Fort seemed completely impregnable. Compared to Kanha, Bandhavgarh is a tiny Park with nearly the same number of tigers, or at least that is the official figure. Dominated by a cliff in the middle, the Park stretches on either side and though the vegetation is fairly similar, the meadows of Kanha are missing though there are a few grasslands, which were once regular swamps. Formerly a part of the Rewa kingdom, famous for its white tigers, Bandhavgarh is among the best-organized wildlife Reserves in the country. The jungle camp run by K.K. Singh and the White Tiger Lodge are the two main resorts at Tala. Today the pure Wild Buffalo, Chattisgarh's state animal, is struggling for survival in Indravati National Park and Udanti Wildlife Sanctuary, while the state bird, the Bastar Hill Myna, is under threat in the beautiful forests of Kanger Valley National Park. On your India wildlife tour you can visit the Bandhavgarh National Park, where the white Tigers of Rewa were discovered. The delighted Maharaja converted his summer palace at Govindgarh into a safe haven for the white tigers. Bandhavgarh, once a hunting reserve of the royal family of Rewa was declared a park in 1968. Wandering through the Bandhavgarh national park on an Elephant Back, the chances of seeing a tiger are quite good. Among the other wild attractions include, Nilgai, Chausingha, Chital, Chinkara, Wild Boar and sometimes a Fox or Jackal. 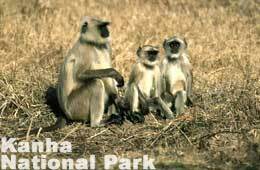 While on wildlife tour to Kanha you can visit Bamni Dadar, situated near the national park. This place is also known as the sunset point. The Kanha National Park is at it scenic best at this point. The sunset from this spot is mesmerizing. The eminent natural splendor of the park comes to the fore here. The grazing sambar, barking deer, gaurs, and other animals make the ambience magical. The ideal time to visit Kanha National Park is in the months of April - June and November - January. The park is closed from July - Mid-November i.e. the monsoon season. Nagpur is the nearest Airport to visit Kanha National Park and is also connected with Mumbai by various domestic airline services. 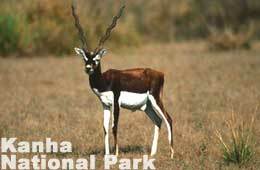 From Nagpur one can hire the taxi / bus up to the Kanha National Park available in plenty and in large frequency. Jabalpur is the nearest railhead to visit the Kanha National Park. From Jabalpur the tourists can hire a bus / taxi up to the national park. Kanha National Park is well connected to Jabalpur 175-kms, Khajuraho 445-kms, Nagpur 266-kms, Mukki 25-kms and Raipur 219-kms by road. There are regular and frequent bus services available from Jabalpur to Kanha.The Madhya Pradesh State Tourism Development Corporation operates a Jeep Service for the tourists to visit in and around the park. The advance booking has to be made regarding the local sightseeing tour. Your tour to Kanha would be more exciting and comfortable with the good accommodation options available here. Apart from the government tourist lodges, rest houses, and log huts, there are private hotels and rest houses for the tourists.